The Inuyama Castle was built at its present location in 1537 by Oda Yojirou Nobuyasu, an Uncle of Oda Nobunaga (one of Japan's greatest samurai warriors who attmpted to unify the nation during the period of the Warring States). It is the oldest standing castle in Japan. In the years following its construction,lordship of the castle changed frequently. The largest configuration of the castle was completed around the time of the Battle of Sekigahara in the year 1600. In 1584, during the Battle of Komaki Nagakute, Toyotomi Hideyoshi and his army of 120,000 strong from Osaka entered the castle, from which he waged war against Tokugawa Ieyasu, whose force were spread over Komaki Mountain. Lordship of the castle was bestowed on Naruse Masanari in 1618 during the Edo Period and was maintained by Naruse and his descendants until the Meiji Period. In 1871 (Meiji 4), abolition of the clan system and the establishment of the prefectures resulted in a government seizure of the castle. Consequently, most of the castle's surrounding buildings were torn down. The central keep and the stone wall,as you see them today,were the only structures left intact. Extensive reconstruction work on the castle began in 1961 and was completed four years later in 1965. 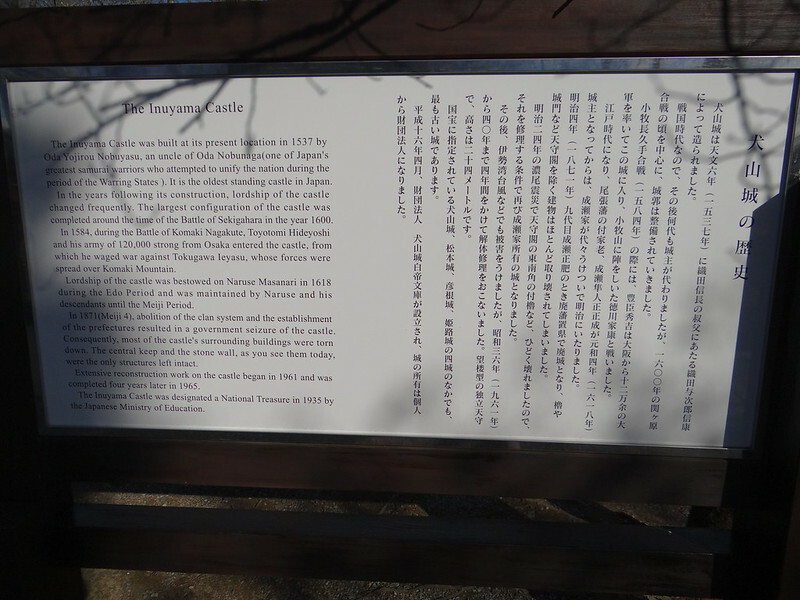 The Inuyama Castle was designated a National Treasure in 1935 by the Japanese Ministry od Education.